Global share markets pulled back a bit over the last week on the back of trade and growth worries, but the Australian share market managed a small rise led by consumer stocks and yield sensitive utilities and real estate shares. Bond yields fell, helped by a dovish ECB. Commodity prices mostly fell and the $US rose and this saw the $A decline helped down by increasing expectations of lower interest rates in Australia. The IMF catches up to markets. 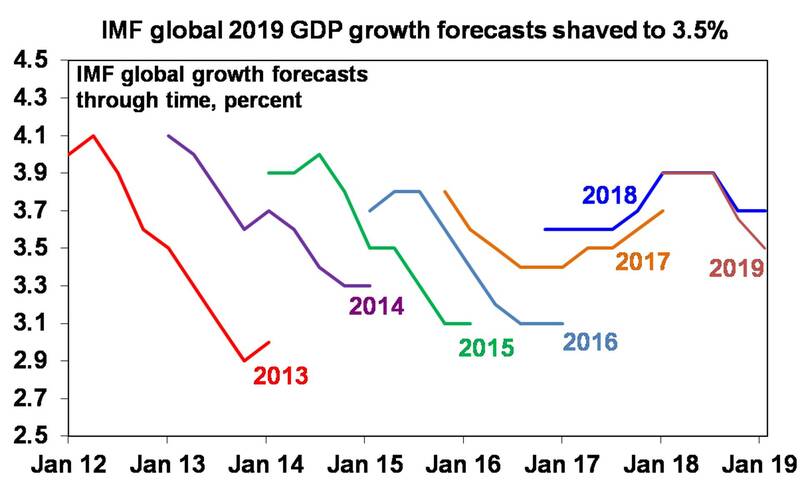 While the IMF revised down its 2019 growth forecast from 3.7% to 3.5% and its 2020 global growth forecast from 3.7% to 3.6% and warned of threats to global growth there was nothing new here. As usual the IMF is just catching up to the slowdown in global growth seen last year and the falls seen in share markets. That said the return to the post GFC norm of growth downgrades (where global growth forecasts start near 4% and end near 3%) reminds us that we have still yet to escape the caution and fragility that has characterised the post GFC period. This is clearly a threat, but it also keeps inflation down and monetary policy easy which is a positive for investment markets. 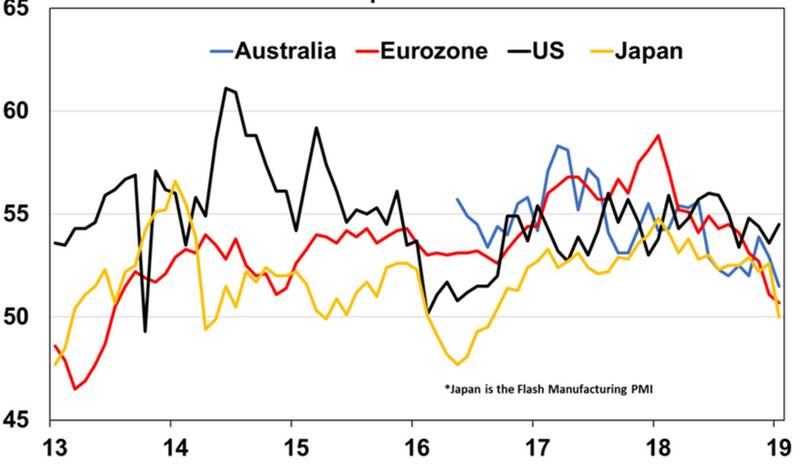 Business conditions PMIs indicate that the global growth slowdown has continued into January.While January “flash” PMIs rose in the US, they fell in Europe, Japan and Australia. See the next chart. This will maintain pressure for global policy easing. Our view remains that shares will do better this year thanks to much improved valuations, likely policy support and a stabilisation and improvement in global growth. But after a huge rebound since the December lows shares are vulnerable to a short term pull back/re-test of December lows in the face of a long worry list. Things that would get us more bullish from here regarding the short term are: a successful retest of the December lows or technical support levels, stimulus in China getting the upper hand, confirmation of an easier Fed, ECB easing, continuing progress in US/China trade talks, an end to the US government shutdown and signs the debt ceiling will be raised, a bottoming in profit revisions and good earnings reporting seasons globally and in Australia, stronger than expected economic data and a bottoming in PMIs and share markets breaking through resistance on strong breadth. We are making some progress on these and we don’t necessarily need to see all of them, but we do have a way to go yet. The past week saw no real definitive progress on a Brexit plan but a “no deal” Brexit continues to look unlikely. As we pointed out last week parliamentary support for a “no-deal” or hard Brexit is very low (at maybe just 10% of parliament) and signs of bipartisan support to extending the Brexit deadline if agreement is not reached just adds to confidence we will see either a “soft” Brexit or no Brexit as opposed to a “no deal” Brexit. There is a long way to go though and the uncertainty is not helping the UK economy. In Australia, the decision by NAB to catch up to last year’s mortgage rate increases put through by other banks highlights ongoing funding cost pressures faced by the banks on the roughly 35% of their funding that they get outside of bank deposits. With short term funding costs rising sharply again in recent months (as evident by a rise in the spread between the 90 day bank bill rate and the expected cash rate to around 60 basis points compared to a norm of around 23 basis points) pressure remains on the banks, putting ongoing upwards pressure on mortgage rates, resulting in a de facto monetary tightening. Coming at a time when households with a mortgage are being adversely affected by falling home prices in Sydney and Melbourne its consistent with views that the RBA will lower the cash rate this year. US economic data was mostly good. Existing home sales fell sharply and the leading index fell in December (although this was due to the share market fall), but against this the Markit composite business conditions PMI rose marginally in January to a solid reading of 54.5, jobless claims fell to a 49-year low and home prices continue to rise. The US December quarter earnings reporting season is actually coming in pretty good. 108 S&P 500 companies have reported so far with 76% beating on earnings with an average beat of 1.9% and 59% beating on sales. Earnings growth is running at 15.8% year on year for the quarter. As widely expected the ECB left monetary policy unchanged but its acknowledgement that the risks to growth are on the downside opens the door to more monetary easing ahead with President Draghi reiterating that all the ECB’s tools are on the table. Assessments show that the ECB will announce another round of cheap bank funding (or LTROs) at their March meeting and a rate hike is years away. Another slide in Eurozone business conditions PMIs in January indicates that growth is continuing to slow. Similarly the Bank of Japan made no change to its monetary stimulus keeping the pedal as it revised down its inflation outlook. Japan’s business conditions PMI also fell sharply in January warning of slower growth. No surprises from Chinese data – growth is slowing but not collapsing. December quarter GDP growth came in at 6.4% year on year which left 2018 growth as a whole at 6.6% which was actually a little bit stronger than the expectation for 6.5% growth. Meanwhile, growth in industrial production and retail sales actually perked up a bit and while unemployment rose to 4.9% from 4.8% its in the same range its been in for a year. Nevertheless, growth is still likely to slow a bit further – as exports fall after frontloading to avoid tariff hikes – necessitating more policy stimulus. Expect Chinese growth this year of 6.2%. Australian jobs up but house prices down. Labour market data for December presented a mixed bag with better than expected jobs growth and a fall in unemployment back to 5%, but a fall in full time jobs, a further slowing in annual jobs growth and still high underemployment. Forward looking labour market indicators remain solid but have lost some momentum. Consistent with this, the CBA’s business conditions PMI fell further in January continuing the downtrend since March 2017. Meanwhile, data from Domain confirmed that property prices continued to slide in the December quarter driven by the once booming cities of Sydney and Melbourne as a combination of negative forces impact led by tight credit, rising supply and falling prices feeding on themselves. It is now likely to see Sydney and Melbourne home prices falling another 15% or so this year as part of a total top to bottom fall of 25% which with broadly stable prices elsewhere will see national average prices fall another 5 to 10% this year. What’s driving the falls is well known, but what will cause the downswing to bottom out? It’s a while off yet but expect a combination of RBA rate cuts flowing to lower mortgage rates, improved affordability thanks to lower prices, continuing strong population growth, the prospect of slowing new supply and possibly some form of Government support (like a new round of Federal First Home owner grants) to help prices stabilise next year. Globally the Fed on Wednesday and continuing US/China trade talks (with Vice Premier Liu He travelling to the US for talks on Wednesday and Thursday) will likely dominate whereas in Australia the focus will be on December quarter inflation data to be released on Wednesday. Our expectation is that the Fed will leave interest rates on hold and repeat the “patient” and “watching” message of late supporting expectations for an extended pause in rate hikes and flexibility to do whatever it can to keep the expansion going. The trade talks are expected to make further progress – but it looks like there is still a long way to go in terms of the structural issues with plenty of potential for periodic upsets albeit views remain that a solution will be reached in the months ahead. US data releases are likely to continue to be affected by the shutdown but in terms of what is scheduled to be released expect to see a slight dip in consumer confidence (Tuesday), December quarter GDP (Wednesday) to rise 2.6% annualised, inflation as measured by the core private consumption deflator for December (Thursday) to remain at 1.9% year on year, employment costs in the December quarter (also Thursday) to have risen 2.9%yoy, the January ISM manufacturing conditions index (Friday) to stay around 54 and January jobs data (Friday) to show a solid 160,000 gain in January payrolls (after the huge 312,000 gain in December), unemployment to fall to 3.8% and wages growth to remain around 3.2% year on year. The US earnings reporting season will also ramp up. Eurozone December quarter GDP growth (Thursday) is expected to show growth stuck around 0.2% quarter on quarter which will see annual growth slow further to 1.2%yoy. Meanwhile, economic confidence (Wednesday) is likely to have slipped again in January, December unemployment (also Thursday) is likely to have remained at 7.9% and core inflation for January (Friday) is expected to remain at 1%yoy. All of which is consistent with more ECB stimulus. In Australia, expect headline and underlying inflation for the December quarter (Wednesday) of around 0.5% quarter on quarter or 1.8% year on year. Underlying inflationary pressures are likely to remain weak and falls in petrol prices and health costs are likely to have been offset by an increase in tobacco excise. Meanwhile, expect the NAB business survey (Tuesday) to show a further fall in confidence, credit growth (Thursday) to remain modest and CoreLogic data for January to show a further fall in home prices (Friday). The Banking and Finance Royal Commission report will also be delivered to the Government on Friday and amongst other things will be watched in terms of its implications for bank lending. Global shares are likely to see volatility remain high with the high risk of a re-test of December 2018 lows, but valuations are now improved, and reasonable growth and profits should support decent gains through 2019 as a whole helped by more policy stimulus in China and Europe and the Fed having a pause. Low yields are likely to see low returns from bonds, but they continue to provide an excellent portfolio diversifier.Unlisted commercial property and infrastructure are likely to see a slowing in returns over the year ahead. This is likely to be particularly the case for Australian retail property.